Have you ever tried to find THE perfect gift for someone that you love? That was my situation this past Christmas. I didn't know what to get my mother-in-law and my own dear mum. To top it off, my mum is one tough cookie to buy for.Then one day, I was surfing the net and came across these really beautiful mother and grandmother bracelets with sterling silver letter beads, and swarovski crystals in the birthstone colors. I thought, "Perfect! I can make these". It was much more of a project than I expected - what size beads to use, how many to order (they weren't cheap!)... and then organizing them and stringing them to see how my design looked, rearranging, restringing... You know, all the things you do when trying to design something you've never done before.Long story short, I made 2 beautiful bracelets in two similar but different styles. Each one was perfect for each grandma. My mum is a tiny little woman, all of 4 foot 9 inches. She is very conservative and doesn't like being the centre of attention. I made her a one-strand grandmother bracelet with "Popo" in the middle (that's the name my kids call her), and with my kids' names, one on each side. The bracelet is quite delicate and sparkly, yet still understated (just like my dear mum). My mother-in-law is a tall and young 50-something grandma who can definitely carry off something more glam. Her gorgeous three-strand grandma bracelet has my kids' names and the name "Grandma", each on a separate sparkly strand. The swarovski crystal beads are in the birthstone colors: garnet for January-born Zoe, ruby for Edgar, born in July, and amethyst for Grandma - she was a February baby. This bracelet has much more "presence", just like my beloved mum-in-law. These bracelets are gorgeous no? They would be great as mommy bracelets too. Read on to learn how to make your own. 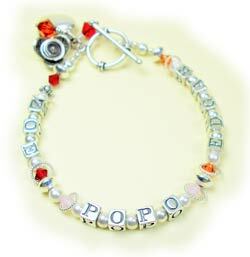 I made a tutorial page for the Popo Bracelet, and the 3 strand-bracelet-page can be found here.